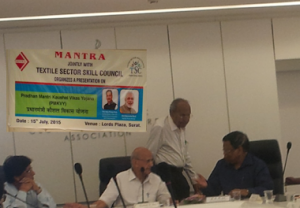 Skill development awareness program on “Pradhan Mantri Kaushal Vikas Yojna (PMKVY)” was jointly organized by Textile Sector Skill Council (TSC) and Man Made Textile Research Association (MANTRA) on 15th July 2015 at hotel Lords Plaza, Surat. 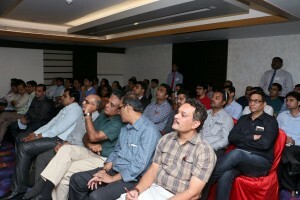 In total 45 delegates from local Weaving & Processing house attended the program. Dr. S.K. Basu, Director, MANTRA welcomed all guest & dignitaries. Mr. Rajnikant Bachkaniwala, Vice-President, MANTRA in his keynote address said that skill training is need of the local industry and industrial units should exploit the scheme offered by Govt. of India. Dr. J.V. Rao, CEO, TSC, in detail explained formation of Textile Sector Skill Council and its role in skill development of the industry. He further in detail explained PMKVY scheme and how textile industrialist can take part in it. He also said the exact role of trainee, the trainer, the mill and agency like MANTRA in the scheme. 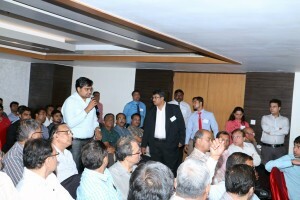 The presentation by Dr. Rao was followed by detailed question-answer session where delegates raised queries and which were duly satisfied by Dr. Rao. The program was followed by dinner. There are few units keen to take part in this scheme for which MANTRA will do follow up.